For other uses, see Rugby station (disambiguation). * Annual estimated passenger usage based on sales of tickets in stated financial year(s) which end or originate at Rugby from Office of Rail and Road statistics. Methodology may vary year on year. Rugby railway station serves the town of Rugby in Warwickshire, England. It opened during the Victorian era, in 1885, replacing earlier stations situated a little further west. Since the closure of the former Rugby Central station on the now-abandoned Great Central Railway route through the town, it is Rugby's only station. Between 1950 and 1970 the station was known as Rugby Midland before reverting to its original title. The station underwent an extensive upgrade during 2006–2008, with extra platforms added, and a new ticket office and entrance building constructed, however the original Victorian part of the station was retained in the upgrade. 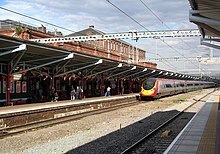 Rugby station is at the centre of two important junctions of the West Coast Main Line (WCML) connecting London to Birmingham and North West England and Scotland. The junction of the Trent Valley Line to the North West, and the Rugby-Birmingham-Stafford Line to Birmingham is a short distance west of the station. East of the station, the Northampton Loop Line diverges at a junction from the direct line to London. Until the 1960s it also had routes to Leicester, Peterborough East and Leamington Spa (Avenue) but these have all since been closed. The present station, managed by Virgin Trains, is located roughly half a mile north of Rugby town centre. On the WCML as a whole, it is located 82 miles (132 km) north of London Euston, and 319 miles (513 km) south of Glasgow Central. West Midlands Trains operate frequent regional services under the London Northwestern branding between London Euston or Northampton to Birmingham New Street and they operate services between London Euston to Stafford, Stoke-on-Trent and Crewe (via the Trent Valley Line). 4tph to London Euston, one slow and two semi-fast via Northampton and one is an express service. 1tph to Crewe via Stafford and Stoke-on-Trent. A Virgin Trains Pendolino calls at Rugby. Since the 1960s, Rugby is served only by the West Coast Main Line. However, as the WCML divides here on either side of the station, it provides an interchange between the routes and consequently many trains stop here. In the chainage notation traditionally used on the railway, the station is 82 miles 4 chains (82.05 mi; 132.05 km) from Euston. To the southeast of the station, the original London and Birmingham Railway (L&BR) line (opened 1838), which runs directly to London, is joined at a grade separated junction near Hillmorton by the Northampton loop line (opened 1881) which runs to Northampton before rejoining the line to London at Hanslope Junction. This junction is 81 miles 28 chains (81.35 mi; 130.92 km) from Euston. To the northwest of the station the WCML diverges again between the original London and Birmingham line, now referred to as the Birmingham Loop, which runs westwards to Coventry and Birmingham, and the Trent Valley Line (opened 1847) which diverges at a flyover junction northwestwards towards Stafford and the North West of England and Scotland. It is 83 miles 18 chains (83.23 mi; 133.94 km) from Euston. The Midland Counties Railway (later Midland Railway) line to Leicester and the East Midlands which opened in 1840. In the mid-19th century this was an important main line, as the junction at Rugby provided the Midland Railway with its only link to London. Nearly all rail traffic between London and the north passed through Rugby, making it one of the most important railway junctions in the country. Increasing congestion at Rugby meant that Midland Railway opened its own route from Leicester to London in the late 1860s. The Leicester to Rugby line lost its earlier importance, and became little more than a country branch line, it continued to operate as such for nearly a century until it was closed on 30 December 1961. The Rugby and Stamford Railway which was a secondary cross-country line owned by the London and North Western Railway which ran from Rugby to Peterborough via Market Harborough. The line was opened on 29 April 1850. It originally ran to Stamford where it joined the Midland Railway's Syston and Peterborough Railway. But later on, in order to gain a more direct route, the LNWR gained permission to build a line from Seaton to the Northampton and Peterborough Railway near Wansford, part of which survives as the Nene Valley Railway. Traffic was never heavy, and Doctor Beeching viewed it as an unnecessary duplication of the Birmingham to Peterborough Line and it was closed on 6 June 1966. The Rugby to Leamington Line which was a country branch line to Leamington Spa which was opened on 1 March 1851. Local passenger services were withdrawn in 1959, and the line closed as a through route in 1966. The first railway station to be built in Rugby was a wooden temporary structure located around half a mile to the west of the present station. It opened on 9 April 1838 when the London and Birmingham Railway was constructed. The original station was located on the western side of where the railway crossed Newbold Road (the Rugby to Leicester tollpike road now the A426) because at the time this was the only road north from Rugby. The first station lasted only a few years. When a junction was made with the Midland Counties Railway in 1840, a new station was built at the site of the junction, which opened on 4 July 1840; it was 990 yards (905 m) to the east of the original station, and 150 yards (140 m) to the west of the present station. A new road, Railway Terrace had to be built to link it to the town centre, because at the time it was located in open countryside. This second station was effectively managed by two companies – the London and North Western Railway and the Midland Railway – and for this reason grew up in a haphazard fashion. It was at first no more than a temporary wooden structure, but was gradually rebuilt into a more permanent structure over the following decade. This station consisted of platforms at each side of the track with one bay platform. The platforms were rather low and passengers complained of having to perform an "acrobatic feat" to board trains. The station was at the centre of a busy junction and often saw chaotic scenes. It featured, only lightly disguised, in Charles Dickens's story Mugby Junction. The second station lasted until the 1880s, when a new line from Rugby to Northampton (the Northampton loop) was built, the old station was deemed by the LNWR to be no-longer satisfactory, and in 1882, £70,000 was allocated to replace it with the current station which opened on 5 July 1885. Another £30,000 was allocated to build a hotel, although this was never built. The Midland Railway retained the part of the older station which it had managed, however. One platform of the old station, separate from the new station, continued to be used by local trains on the Midland Railway's branch to Leicester until 8 March 1930. No trace of this now remains, however, as it was demolished in the 1960s to make way for the postal sorting office. When constructed the station consisted of one large island platform with bay platforms at each end for terminating local services. The main island platforms are accessed from a tunnel at road level and a ramp leading to the platforms. When constructed the station had a large steel and glass trainshed roof which consisted of 117 ft (35.6 m) wide spans on each side, covering the station platforms and tracks. Originally the sides of the station had glass side screens but these were later removed. The condition of the roof deteriorated, and in the 1980s the glass over the tracks was removed, and finally the entire structure was dismantled in 2000 when it became unstable, and was replaced with modern canopies over the platforms. A Class 310 electric multiple unit at one of the former northbound bay platforms at Rugby in 1975. The station had one of the longest platforms of any British railway station, at 1,381 feet (421 m), but the two main island platforms were both shortened as part of the 2007–08 station upgrade. The platform was long enough to allow two trains to call at it at the same time. This unusual feature was enabled by 'scissors crossings' halfway along the platforms. The scissor crossings were X-shaped junctions which allowed one train to pass another one already in the platform, and call into the same platform ahead of it, and allowed the train to the rear to pull out of the station, effectively doubling the capacity of the platform. The scissor crossings remained in use until the railway was electrified in the 1960s. In 1899 a second station, Rugby Central, was opened in Rugby. To distinguish it from the other station, the present station became known as Rugby Midland. Rugby Central closed in 1969, and Rugby Midland reverted to being called just Rugby in 1970. The station came under the management of the London and North Western Railway (LNWR) (1885–1923), and then the London, Midland and Scottish Railway (LMS) (1923–1948), and then the nationalised British Railways (1948–1997). It is now owned by Network Rail. The new north island platform added in the 2008 upgrade. Containing platforms 5 and 6. As a part of the West Coast Main Line modernisation programme carried out by Network Rail, major track restructuring work was carried out to allow higher speed running through Rugby, and the station itself underwent a major upgrade; three new through platforms were added, bringing the total up to five, including a new platform on the south side of the station and a second island platform on the north side, along with a new ticket office and entrance. Work began in September 2006 and was completed late in 2008. It was at one time thought that remodelling of the track layout would entail complete demolition of the present station, but the final plans involved retention of the existing island platform and buildings. Previously non-stopping trains passing through Rugby were limited to 75 mph, the track upgrades raised the speed to 125 mph, thus eliminating another bottleneck from the WCML. The platform on the south side of the station opened for use on 29 May 2007, and as a result all of the platforms were renumbered. This platform became Platform 1, the former Platform 1 became Platform 2 and 2 became 4. The additional platforms on the north side of the station are numbered Platforms 5 and 6 and they opened on 27 August 2008. Platform 8 became Platform 3. At the same time the former westbound bay platforms originally numbered 3, 6 and 7 were removed. Another distinctive feature of the local railway landscape also vanished at this time – the 'bird cage' bridge. This being a 'heavy' girder bridge of two substantial spans over the West Coast Main Line to the east (up side) of the station. This was the means by which the Great Central Main Line crossed the London & North Western Railway competing line. A shed for three locomotives was opened here in 1838 by the London and Birmingham Railway and another in 1847. These were demolished to make way for two larger sheds in 1852, one for the use of the Northern Division locomotives and one by the Southern Division. The LNWR replaced these with a single 12-road shed in 1876, which was closed in 1965, but used for stabling diesel shunters. An adjoining 12-road shed was opened in 1886, but was closed and demolished by British Railways in 1960. Rugby once had the largest concentration of mechanical signalling in the world and was home to one of the most impressive signal gantries in Britain. Situated to the south of the station and erected in 1895, it spanned three tracks and carried forty-four semaphore arms. Every arm was duplicated due to sighting difficulties that resulted from the Great Central Railway's 'Birdcage' bridge crossing the WCML behind the gantry's location. The gantry acquired the nickname of "the Rugby Bedstead" on account of its appearance. In 1939, the London, Midland and Scottish Railway resignalled the Rugby area with colour light signals, although the mechanical signal boxes were retained. The famous signal gantry became redundant, following which it was divided up into smaller pieces to form a number of smaller structures for re-use elsewhere. SGE was awarded a contract to resignal the Rugby area in preparation for electrification. Rugby Power Signal Box (PSB) opened in 1964. It is located east of the station, on the south (Down) side of the railway. The whole station area, together with part of the WCML stretching as far south as Castlethorpe, was controlled from this new box. It was equipped with an 'NX' (entrance-exit) panel. In 1991, Rugby PSB took over control of the Northampton area using Solid State Interlocking (SSI). Rugby PSB closed in May 2012 when control of Northampton was transferred to Rugby SCC. Rugby Signalling Control Centre (SCC), located north-west of the station, opened in 2004. Initially, its area of control was limited to a portion of the WCML between Kings Langley and Linslade Tunnel. The current area of control is Kings Langley, Hertfordshire to Armitage in Staffordshire. Area of control also includes small portions of branch lines around Nuneaton; these include the Coventry-Nuneaton (from Three Spires to Nuneaton) and part of the Arley/Hinckley lines (Arley Tunnel to Padge Hall). In March 2016, the WCML South Rail Operating Centre (ROC) was opened at Rugby – this will supervise the signalling on the entire southern end of the WCML and associated branch routes. Bus route 4, operated by Stagecoach Midlands, connects the railway station with Rugby town centre and the suburbs of Cawston and Bilton. Bus route D1 and D2, operated by Stagecoach Midlands, connects the railway station with Rugby town centre and the suburbs of Barby, Braunston, Brownsover, DIRFT, Hillmorton, and Kilsby. The service then continues onto serve the nearby town of Daventry. Rugby Central railway station - former Great Central station serving Rugby. Rugby Parkway railway station - proposed new station which would be on the town's outskirts. Midland Counties Railway Viaduct, Rugby - disused railway viaduct. ^ Elliott 1985, pp. 14–20. ^ Elliott 1985, pp. 22–24. ^ Elliott 1985, pp. 24–26. ^ Elliott 1985, p. 10. ^ Elliott 1985, p. 16. ^ Elliott 1985, p. 16&17. ^ a b c d Elliott 1985, p. 33. ^ Elliott 1985, p. 35. ^ Elliott 1985, p. 34. ^ "West Coast upgrade enters the final stage". Railway Gazette. 20 March 2008. Retrieved 31 January 2018. ^ "Question mark over station's future". BBC News. 8 January 2003. Retrieved 31 January 2018. ^ "WRCM – Rugby Remodelling". Network Rail. Retrieved 31 January 2018. ^ "New platform at Rugby station". Geograph.org.uk. Kevin Flynn. Retrieved 31 January 2018. ^ "Landmark 'Birdcage' bridge dismantled". Rugby Advertiser. 4 January 2007. Retrieved 24 September 2016. ^ Griffiths, Roger (1999). The directory of British engine sheds and principal locomotive servicing points: 1. Oxdored: OPC. p. 154. ISBN 0860935426. ^ Signalling Installations for British Railways – Part Six – London Midland Main Line Electrification. Harrow: S.G.E. Railway Signals Ltd. 1966. p. 2. RS75. ^ Foster, Richard D. (1982). A Pictorial Record of L.N.W.R. Signalling. Oxford: Oxford Publishing Company. p. 80. ISBN 0-86093-147-1. ^ "Rugby ROC opens". Rail Engineer UK. Retrieved 31 January 2018. ^ "4 Bus Route & Timetable: Brownsover - Bilton | Stagecoach". www.stagecoachbus.com. Retrieved 10 January 2019. ^ "D1 Bus Route & Timetable: Daventry - Rugby | Stagecoach". www.stagecoachbus.com. Retrieved 10 January 2019. ^ "D2 Bus Route & Timetable: Rugby - Daventry | Stagecoach". www.stagecoachbus.com. Retrieved 10 January 2019. Elliott, Peter H (1985). Rugby's Railway Heritage. ISBN 0-907917-06-2. Wikimedia Commons has media related to Rugby railway station. Pendolino Cab Footage – A Virgin Trains Pendolino heading northbound (towards the Trent Valley). Pendolino Cab Footage – A Virgin Trains Pendolino heading southbound (towards London). virg.co/rug – Rugby Station live departure boards.